In short, misguided civil and moral upheaval resulted in systematic killing of over 800,000 people by their family and neighbors, along with the assassination of Rwanda’s President. Most of these murders were undertaken with machete’s (they didn’t want to waste money on ammunition), and dead bodies that didn’t rot in the sun were dumped into mass graves. Over twenty years later, and Rwanda is still dealing with the aftermath of this (http://en.wikipedia.org/wiki/Gacaca_court). Over a few weeks in Rwanda I was able to visit three different Genocide Memorials in and around the capital city of Kigali. One was the “official” memorial, complete with an audio tour and signs in english. The other two, however, were more simple….and in my eyes……much more powerful. Ntarama Church was one of the churches where people fled because they erroneously felt that they would be protected. In the end, most of these people perished. We arranged for a driver to give us a ride to the memorial, which is a story all unto itself…. When we arrived at the church/memorial the gate was locked, but a local woman/caretaker came and let us in. There was nobody else at the memorial, and we walked around in an eerie silence. There were no signs and no stories. There were no windows or lights, just sunshine filtering through elaborate bricks arranged to allow for air flow. Large holes in the concrete wall of the church shows where grenades exploded. The floor of the church was littered with personal belongings of victims that have remained since the massacre. 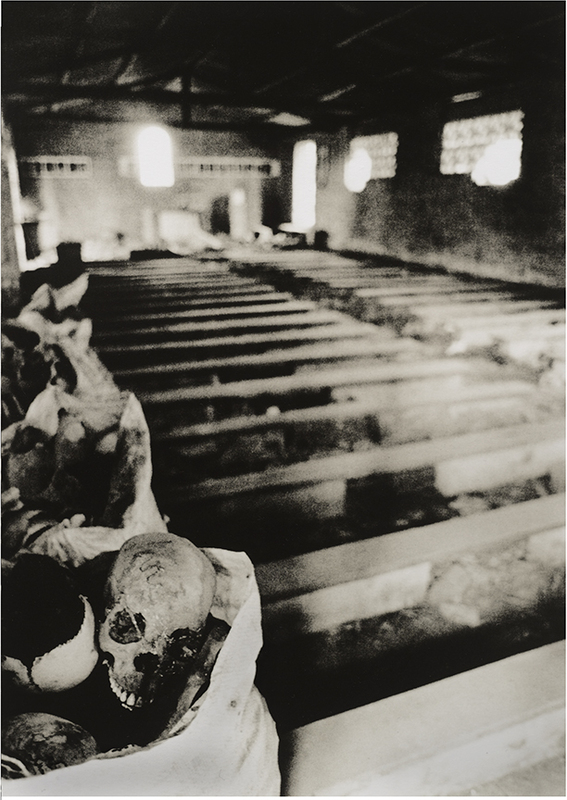 In the rear of the church, wooden shelves held hundreds of human skulls. Skeletons and bones were still being unearthed, and this bag had recently been dug up. They were to be cleaned up and added to the shelves with the others. At the time, I was shooting a Nikon F3, with T-Max 3200, and printed this image using the “lith” process. As you can see from their images, some changes have been made at the church…..